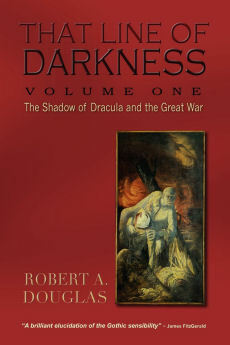 I will be selling copies of That Line of Darkness: The Shadow of Dracula and the Great War (Encompass Editions, 2012) and That Line of Darkness: The Gothic from Lenin to bin Laden (Encompass Editions, 2013) at a 20 percent discount at Word on the Street in Toronto (Queens Park near the College St. entrance) Sunday September 21 between 11AM and 6PM. 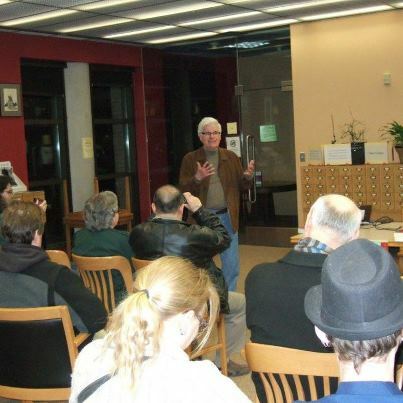 On Tuesday October 22/13, I delivered a presentation "Putting the Gothic into History" at the Toronto Public Library at 7 PM, Palmerston branch (Bathurst and Bloor), on how Gothic conventions apply to the late Victorian period and the Great War and, drawing upon That Line of Darkness: The Gothic from Lenin to bin Laden (Encompass Editions 2013), their application to the Soviet Union, Nazi Germany and modern America. On November 9/13, I spoke in Ottawa at the Main Library on 120 Metcalfe St.
On Saturday June 22/13 between 1:00 and 4:00 PM, I signed at Chapters Bay Bloor in Toronto copies of both volumes of That Line of Darkness: The Shadow of Dracula and the Great War and The Gothic from Lenin to bin Laden, Encompass Editions, 2012 and 2013. 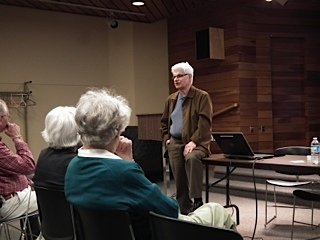 On May 2, I delivered a presentation at the St Catherines Public Library on how the tropes (conventions) of the Gothic apply not only to fiction and film but to the history of Victorian Britain, the Great War, the Soviet era, Nazi Germany and modern America. 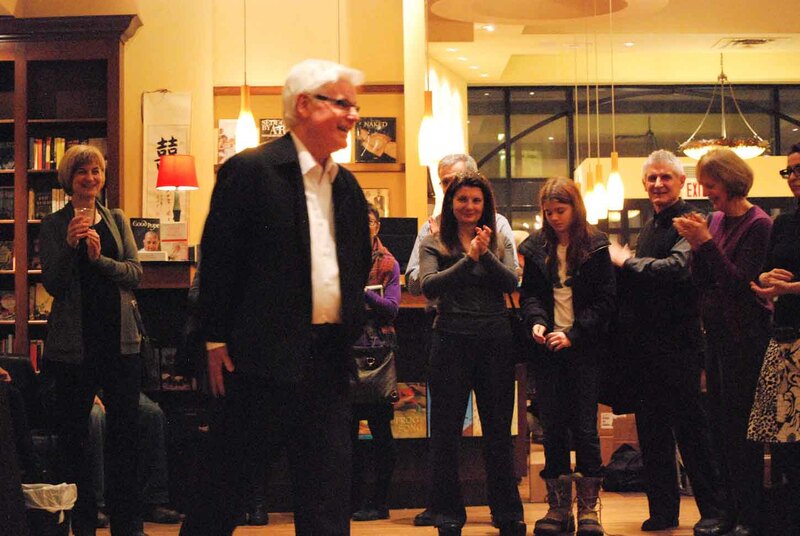 The audience was engaged and inquisitive. 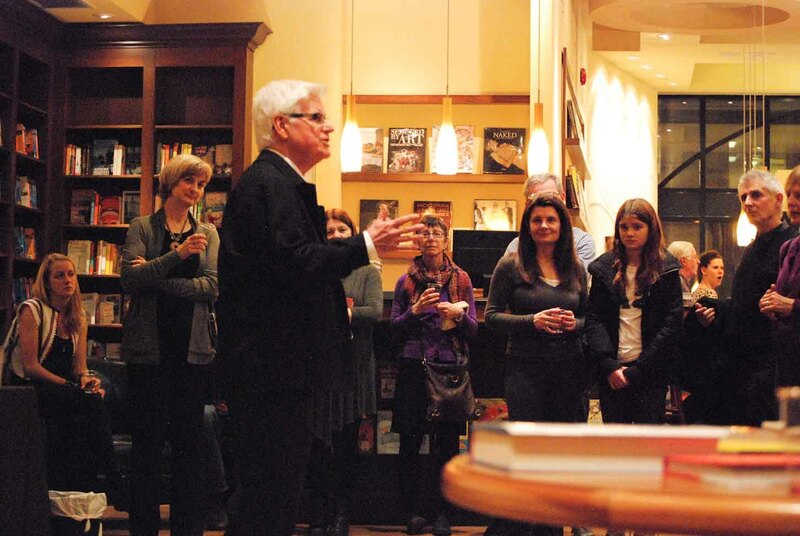 A book launch for That Line of Darkness: Volume II, Encompass Editions, 2013 was held at Ben McNally bookstore (Bay and Richmond) in Toronto on March 7. 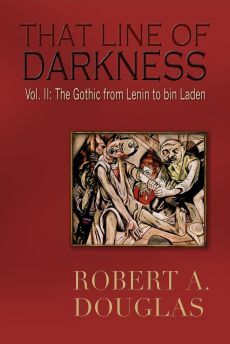 The following is a slightly expanded version of the remarks I delivered at the launch of That Line of Darkness: The Gothic from Lenin to bin Laden, Encompass Editions, 2013. 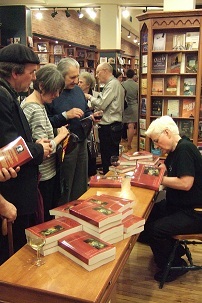 I would like to thank you for attending the launch of this book and welcome the opportunity to say a few words about the process that was undertaken in writing both volumes. Given my passion for history, I knew that I wanted to write. For the first few years of this long process, I explored the culture of fin-de-siècle Vienna and the political polarization in France during the Dreyfus Affair before settling on late Victorian London as my starting point. I became interested in how the academic and popular discourse on the Darwinian revolution affected not religion nor evolutionary biology but devolution and survival of the unfit on social issues namely crime, poverty, prostitution, syphilis, homosexuality and eugenics. When I looked for how naturalistic literature refracted these concerns, I found very little. Thomas Hardy’s Jude the Obscure was a notable exception but the firestorm the book ignited discouraged Hardy from ever writing another novel. I then discovered Gothic fiction, a genre I had never read and discovered that the pressing social issues of the time were explored but displaced through the genre’s tropes and conventions. The reading public did not erupt in anger because, although these novels may have terrified, they were deemed unrealistic. 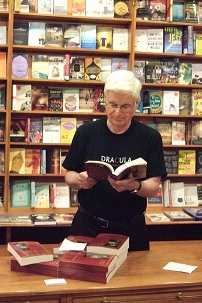 Nonetheless, the novels – Bram Stoker’s Dracula, Robert Louis Stevenson’s The Strange Case of Dr. Jekyll and Mr. Hyde and H.G. 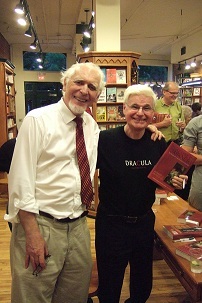 Wells’ novella The Island of Dr. Moreau among others – were a Rosetta stone for exploring the contentious race, class and gender issues of the period. 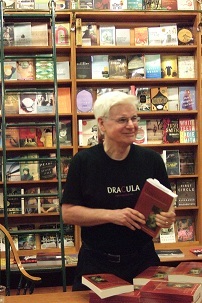 Regardless of how these novels varied from each other, I discovered that they frequently shared Gothic conventions: the demonization of the other, the use of the double or doppelganger, the struggle between the primitive or superstitious past and the modern scientific present, the need for blood purity and the presence of the uncanny or preternatural. The challenge now was to investigate whether these conventions could apply not only to fiction or art but to the collective history of a people. I wondered whether they could be deployed to examine the major historical developments that had long interested me: the Great War, the Soviet Union and Nazi Germany and more recently, modern America and the war on terror. I realized, for example, that by examining the conditions in the trenches where soldiers felt neither alive nor dead, and the appeal of spiritualism among civilians, I could interpret the Great War through the Gothic lens of the uncanny. There was, however, something missing. While reading Jane Mayer’s The Dark Side, I encountered a statement that provided a frisson or eureka moment. While interviewing a former CIA officer, she asked what happened to agents who resorted to enhanced interrogation of those designated enemy combatants. His response was that “when they cross that line of darkness, they have difficulty coming back. They lose their souls.” Given that the Gothic by its very nature was about transgression, I now had my title, leading epigraph and an overarching theme that would connect Victorian England with the vicissitudes of war, the emergence of totalitarian states and contemporary America. Those who crossed that line in Victorian England were chiefly fictional figures from English literature. From the Great War onward, the reverse was true: they were primarily real individuals and groups. I also knew that my original idea of a brief epilogue on America would be jettisoned, that more research would be necessary and that a major chapter on the Cold War was needed to establish links with the recent past and provide historical ballast. The original idea of a single volume was abandoned and, apart from a brief epilogue on the contemporary appeal of the Gothic, the first volume could end with the legacies of the Great War. In the second volume, those legacies provided a bridge to the exploration of totalitarian states. The tumultuous birth of the Soviet Union under Lenin, the features that he established, and how they were expanded under Stalin, became the focus of the Soviet section. The tension between the primitive past and the modern scientific present became the most distinctive Gothic convention in this section because it infused the Marxist-Leninist ideology and the official rhetoric that saturated the media, and dictated economic policies. That motif informed the chapters on the war against the peasantry, the role of artists, Stalin’s war on the Party, and the Great Terror that included the appalling conditions within the Gulag. Despite the inhumanity that characterized the Stalinist era, I profile some individuals who spent years in the Gulag but maintained their humanity by refusing to cross that dark line. When I turned to Nazi Germany, I knew that blood purity was the most applicable Gothic convention. Believing that the general public is more familiar with the Second World War and the Holocaust, my focus became primarily an investigation of how racial purity informed the so-called “good years” of the 1930s: the complicity of medical and philosophical elites, the extent to which artists validated the Nazi ideology, and how that ideology suffused everyday life. I also wanted to explore to what extent proto-Nazism existed during the Wilhelmine era and decided to answer that question through the prism of the life and music of Richard Wagner. The evidence that unfolded challenged my initial preconceptions. The final section concentrated on contemporary America with chapters bookended by the early Cold War and the White House's abandonment of the rule of the law as its response to terrorism as demonstrated in the treatment of enemy detainees. One of the threads discussed in the Cold War chapter was how American prisoners during the Korean War responded to their conditions, the belief that they had been brainwashed, how that fear influenced popular culture and how the CIA sponsored research that would be applied to the training of soldiers if they found themselves in similar circumstances in the future. A program that had been conceived as a defensive weapon became an offensive one after 9/11 when terrorist suspects were interrogated. Other chapters explored the psyche of radical jihadists and how the fundamentalism and absolute certainty underpinned both George Bush and Osama bin Laden. I was not however making a general comparison between the two men but I did perceive how they mirrored each other in their need to see the world through a Manichean lens and their inability to live with ambiguity and grayness: the sentiment that you are either with us or against us informed their worldview. That mindset fuelled the terrorism of bin Laden and Bush’s aggressive response in ordering American troops into the heart of darkness in Iraq, a decision that was based more on fantasy than the realities that existed on the ground. I conceived of the book ending with two epilogues. The first addresses the Second World War insofar as doubling could explain how Hitler and Stalin mirrored each other, and that the lethal effect of deeply engrained demonization contributed to the war of extermination in the East and the implementation of the Holocaust. The second epilogue focuses on the Obama era. Because there was no historical distance, I recognized I had to be sufficiently cautious in my assertions knowing that events could overtake them, but tentativeness is no guarantee of accuracy or nuance. (To a lesser degree, this caveat could apply to my chapters on the Bush era.) Nonetheless, I contend that Obama’s foreign policy has been shaped more by demands of realpolitik and less by the politics of fear even though he has maintained some of the policies of his predecessor. Secondly, Gothic discourse still operates in the domestic sphere. Unlike the Bush era where opposition to the administration’s policies was rooted in real issues, some of the rhetoric toward Obama and the anger manifested toward him in public spectacles were not merely over policy differences. Some of it revealed racist overtones and those who made comparisons between Obama with Hitler and Communism were clearly demonizing the other. Over the course of fourteen years, this project has undergone much reshaping, vast reading, continuous writing and countless editing drafts, deleting large sections, even chapters, if I felt that they did not advance my central thesis. What survived this winnowing process can be found in the pages of the two volumes that I hope will inform, stimulate and provoke. As new books are written that challenge or substantiate the arguments and evidence presented in these volumes, I plan on using this website to comment upon them. History is never a final product but an ongoing conversation. I am speaking before Friends of the Merril Collection about That Line of Darkness: The Gothic Shadow and the Great War, Encompass Editions, 2011. 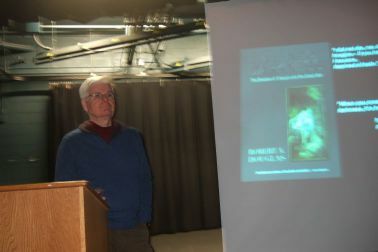 A PowerPoint presentation was given on That Line of Darkness: The Shadow of Dracula and the Great War Encompass Editions, 2011 to an attentive and inquisitive audience at Palmerston Library in Toronto. The image is the author taking a question from a member in the audience. 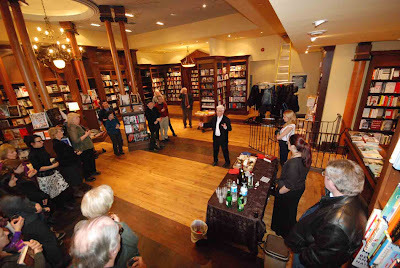 Nicholas Hoare’s book store in Toronto was the launch for my first book, That Line of Darkness: The Shadow of Dracula and the Great War, published by Encompass Editions, the first of two volumes.